Measure the length of your pinky finger (in centimeters). Randomly survey 30 adults for their pinky finger lengths. Round the lengths to the nearest 0.5 cm. Using your sample mean, sample standard deviation, and histogram, what was the approximate theoretical distribution of the data you collected? 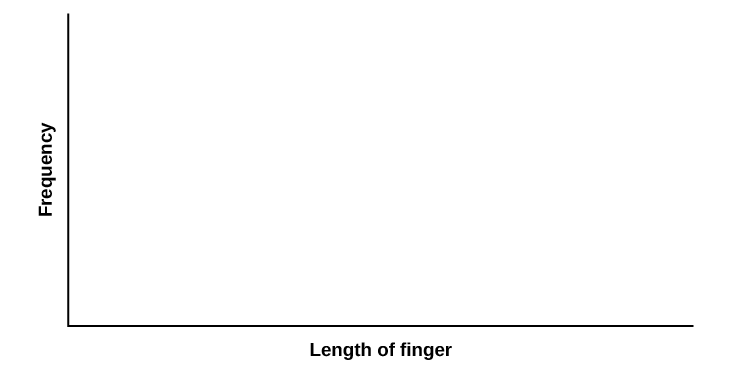 What is the theoretical probability that a randomly chosen pinky length is more than 6.5 cm? Using the theoretical distribution, complete the following statements. Use a normal approximation based on the sample mean and standard deviation. Normal Distribution (Pinkie Length) by OpenStaxCollege is licensed under a Creative Commons Attribution 4.0 International License, except where otherwise noted.